The World’s Most Awarded single malt Scotch whisky unveils their latest luxury expression, Glenfiddich Excellence 26 Year Old. Glenfiddich Excellence 26 Year Old, the latest expression from the World’s Most Awarded single malt Scotch whisky, is an important addition to the family run distiller’s prestigious collection of aged single malts. 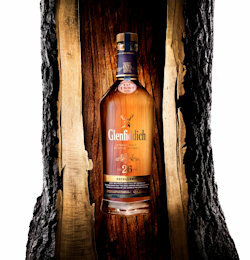 It’s also the first 26 Year Old expression from the Glenfiddich Distillery. With the amount of thought and care that has gone into this single malt, it has all the ingredients to become a must have for any whisky lover. The whisky has been matured exclusively in American Oak ex-Bourbon casks for a minimum of 26 years, and as such is a rare liquid of exceptional quality. Glenfiddich Excellence 26 Year Old is also the first single malt from the Speyside distiller to use Bourbon casks throughout the entire maturation process. To help celebrate the journey of these unique casks, Glenfiddich commissioned celebrated landscape photographer, Simon Butterworth, to capture 26 images that tell the story of the voyage of the wood which makes this whisky so special. Simon’s photographic collection details the journey, from the American Oak being felled, to Scotland for the final seal of approval from Glenfiddich’s founder’s family, who still run the Glenfiddich Distillery today. Presented in an elegant glass bottle with delicate gold lettering, Glenfiddich Excellence 26 Year Old is captured by an oak stopper reminiscent of the Bourbon casks in which it matures. This unique single malt will be a prestigious addition to the collections of whiskey connoisseurs and single malt aficionados all over the world. Available from 26 June 2014 in luxury whisky retail outlets and any Prestige specialist stores, Glenfiddich Excellence 26 Year Old has a recommended retail price of £350.00.